If you don’t find the answer to your question here, please feel free to contact me via email or telephone. I will be more than happy to answer any questions you have. What is a subluxation/joint dysfunction? Why would an animal need Chiropractic care? How do I know if my animal may require Chiropractic care? What can I expect my animal to be like after an adjustment? How does a chiropractor adjust an animal as large as a horse? What kind of education/training do Animal Chiropractors have? Chiropractic works because you are a self-healing, self-regulating organism controlled by your nervous system. Millions of instructions flow from your brain, down the spinal cord and out to every organ and tissue. Signals sent back to the brain confirm if your body is working as it is supposed to. Improper motion or position of the moving bones of the spine, called a subluxation or joint dysfunction, can interfere with this vital exchange of information between brain and body by irritating nerves and compromising the function of affected organs and tissues. Specific spinal adjustments can help improve mind/body communications. Health often returns with improved nervous system control of the body. Chiropractors are experts trained in the neuromusculoskeletal (neruo=nerve, musculo=muscle, skeletal=bone) system. They diagnose and treat disorders of the spine and other body joints by adjusting the spinal column or through other corrective manipulation. Chiropractors provide conservative management of neuromusculoskeletal disorders including, but not limited to, back, neck and head pain (over 90 percent of conditions treated). The common perception of chiropractic is largely associated with the spine being its sole focus of treatment. However, quite the opposite is true. Modern chiropractors treat a vast range of conditions involving not only the spine and back, but also the extremities; from shoulders to fingertips, and hips to toes. Chiropractors have an in-depth knowledge of the anatomy and biomechanics of the human body, and are trained to address conditions from the source, not just the symptoms. They also advise patients on corrective exercises, lifestyle and nutrition. “Subluxation/joint dysfunction” is a term used to describe a problem with a spinal joint. The World Health Organization defines a “subluxation” as a functional problem related to a joint and the structures associated with the joint such as the muscles, tendons and nerves. Subluxation/joint dysfunction can present itself in various ways such as pain, inflammation and restricted movement of the joint. Some types of dysfunction, such as a sprain, will not appear on an x-ray. Chiropractors are trained to identify dysfunction that does not appear on imaging through the use of manual examination and non-imaging diagnostic tests. Chiropractic adjustment or manipulation is a manual procedure that utilizes the highly refined skills developed during four intensive years of chiropractic education. The chiropractor typically uses his/her hands to manipulate the joints of the body, particularly the spine, using a low force high velocity thrust in order to reduce pain, and restore or enhance joint function. Chiropractic manipulation is a highly controlled procedure that rarely causes discomfort. The chiropractor adapts the procedure to meet the specific needs of each patient. No. Each patient’s spine and care plan is unique. With 24 moving bones in the spine, each of which can move in many different directions, we see a wide variety of spinal patterns. Each patient’s care is custom tailored for his or her age, condition and health goals. Of course. When developing a care plan, your chiropractic doctor considers the unique circumstances of each patient. There are many ways to adjust the spine. The method selected will be best suited to your age, size and condition. After patients get the relief they want, many choose to continue with some type of maintenance care. These patients show up for their visits feeling great. Regular maintenance visits can help support the final stages of healing as well as detect and correct new problems before they become serious. Your chiropractor’s job is to offer the very best care. Chiropractors are educated as primary contact health care practitioners, with an emphasis on neuromusculoskeletal (neruo=nerve, musculo=muscle, skeletal=bone) diagnosis and treatment. Preparation for the practice of chiropractic is concentrated on three areas: basic training in the biological and health sciences, specialized training in the chiropractic discipline, and extensive clinical training. Becoming a chiropractor in Canada requires a minimum of 7 years of post-secondary education including no less than 4 years of full-time classroom and clinical instruction at an institution approved by the Council on Chiropractic Education Canada. Animal chiropractic is a manual therapy that addresses dysfunction in your pet’s muscular, skeletal and nervous systems. This is a specialized complementary treatment to your regular veterinary care and is not intended to replace your regular veterinary care. Decreased motion in the joints of the spine and extremities (called joint restrictions or vertebral subluxations); may lead to changes in the surrounding tissues (i.e. the muscles, ligaments tendons and nerves). This can cause inflammation, pain, muscle tension and compensatory changes. Like children, animals are very physically active and experience many types of falls and blows from activities of daily living as well as from participating in sports like agility, flyball, Frisbee, etc. Injuries such as these may cause many symptoms including back, neck, and leg pain, stiffness, soreness or discomfort. Chiropractic care is always adapted to the individual patient. It is a highly skilled treatment, and in the case of animals, very gentle. Animal chiropractic is most often applied to dogs and horses. After a chiropractic treatment your animal may be relaxed and sleepy or more active and playful. After 48-72 hours, some animals may be a little stiffer which is normal. Do not expect major changes after the first visit. Expect to commit to a few treatments to determine the efficacy of chiropractic care. Remember that the chiropractor is not trying to move and entire horse, but rather a specific joint in the horse’s spine. Every joint has sensitive nerve receptors which send messages to the brain. The adjustment, a high velocity, low force thrust by hand, stimulates these nerve receptors. To be successful the adjustment is applied to a specific joint in a specific direction. The adjustment restores normal motion in the joint and alleviates muscle spasm and pain. The veterinary Chiropractic Learning Centre is a professional organization located in central Ontario, offering veterinary chiropractic training. This program is available to Veterinarians and Chiropractors who have graduated from accredited schools and have current licenses. The curriculum consists of a minimum of 220 hours of supervised instruction, in addition to required reading, assignments and case presentations. 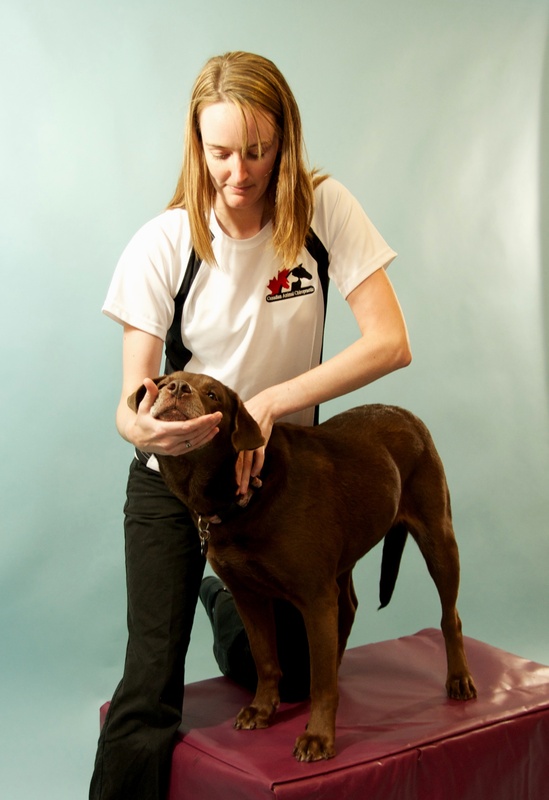 The Canadian Animal Chiropractic Certification Program provides training to Chiropractors and Veterinarians specifically in the areas of canine and equine chiropractic, although other vertebrates are also addressed. This program is approved by The American Veterinary Chiropractic Association, The College of Animal Chiropractors and the International Veterinary Chiropractic Association. This site works looks best with a modern web browser like Mozilla Firefox, Apple Safari, or Google Chrome. If you are using Microsoft Internet Explorer, you are missing out!